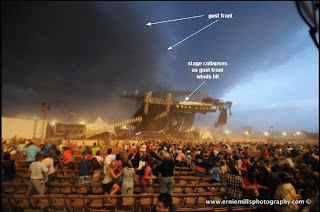 Saturday evening's stage collapse due to strong gust front winds at the Indiana State Fairgrounds in Indianapolis killed 5 people and finished off a week when several people were killed in the U.S. as a result of thunderstorm winds. On Aug. 7, 1 person was killed in southern Missouri when a tree blew onto their car; on Aug. 9, a UPS driver was killed in northeast Indiana when a tree fell on his truck, and on Aug. 10, a woman was killed east of Tulsa OK when thunderstorm winds destroyed a mobile home (this may have been a brief non-supercell tornado from a bow echo on radar). This all serves as a reminder that severe thunderstorm/squall line winds can and do kill people. 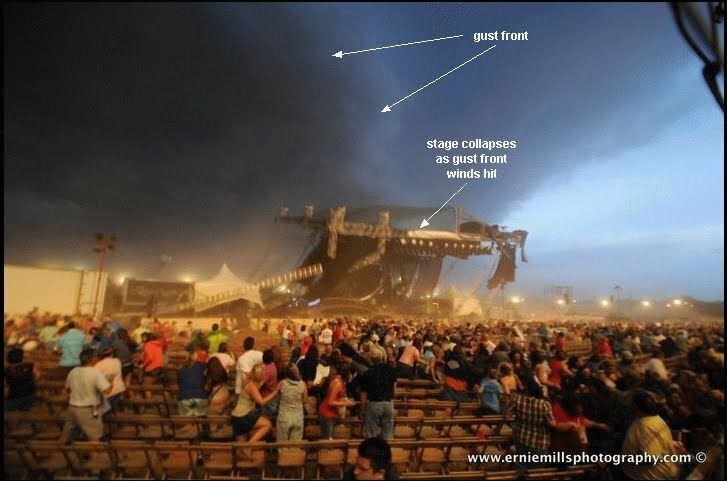 "The Indiana Governor called last night's stage collapse a "freak accident". I respectfully disagree. That was a make shift stage sitting right in the path of that gust front. It doesn't take a genius to know it was disaster in the making (especially when you see Ernie Mill's photos of the shelf cloud as it approached). The concert should have at least been delayed once the warning was issued (10 minutes out) with an orderly evacuation AWAY from that stage. Very sad and preventable incident. It's also another reminder that we in the weather community need to continue to educate the public about weather awareness." I agree... At 8:39 pm EDT, NWS had issued a warning for Indianapolis concerning thunderstorm winds in excess of 60 mph a full 10 minutes before the storm struck the fairgrounds at around 8:50 pm EDT, and severe thunderstorms had been in the area west of Indianapolis approaching for more than an hour before (see radar images above). A shelf cloud (a visual "red flag" to watch for strong wind gusts, see Ernie Mill's photos above) was quite visible as the thunderstorm gust front approached the fairgrounds. 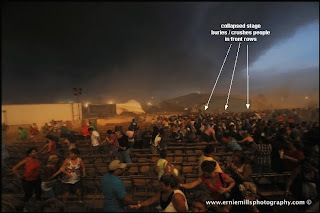 A full evacuation wasn't practical or even necessary, but certainly it should have been clear that the _temporary_ stage structure with its top-heavy lights was a dangerous place to be around in strong winds. 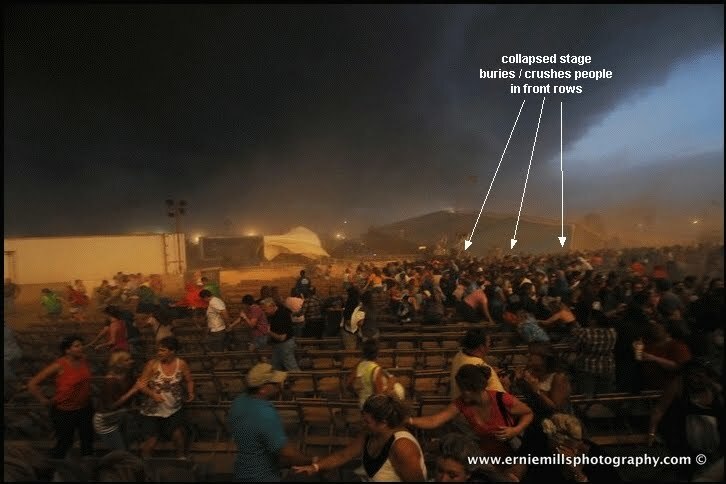 The deaths all occurred in the first several rows as the stage structure collapsed. 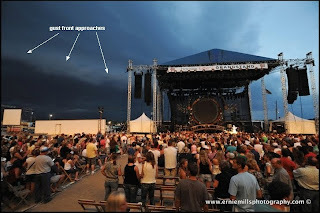 Someone at a microphone should have emphatically told concertgoers seated within a couple hundred feet of the stage to at least move back well away from the stage structure _before_ the gust front hit; that much would not have been difficult to do. From this perspective, Saturday's tragedy was preventable and certainly not a "freak accident" or "fluke". At all public outdoor venues that involve thousands of people, the organizers/managers of the event on-site need to be in consistent touch with a meteorologist or weather-knowledgeable person regarding any potential severe weather that may be approaching, even if it is many miles away yet. And a _clear_ communication line needs to be open to those on stage or in control of the public sound system at the event to let people know where to go in a timely manner before weather hits. While full evacuations may not be practical or possible, people definitely need to be warned and told to move away from dangerous _temporary_ structures that may collapse when gusty thunderstorm winds hit them. That seems like a no-brainer.